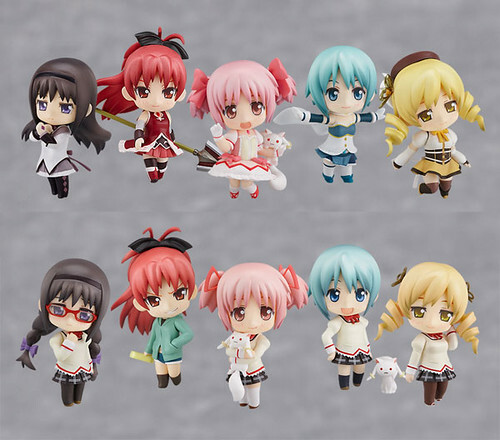 As promised, Nendoroid Petit Puella Magi Madoka Magica set is available for pre-order starting today, July 22. The boxset will contain the five characters in their Puella Magi outfits as well as school uniforms and casual clothes, along with one secret Petit and one extra random Petit from the previous 10 Petits, for a total of 12 Petits. The set is scheduled for January 2012 release, with a price tag of around 6000 Yen for the whole set, or 500 Yen for each Petit.